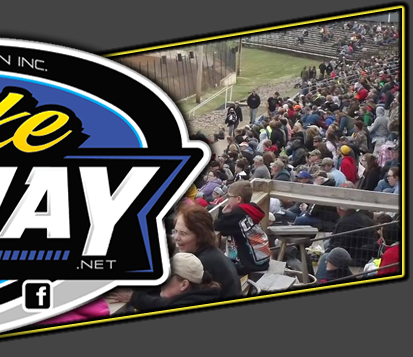 Rice Lake WI, April 23 – Overcoming a forty five minute rain delay when a shower during the heat races hit the track and threatened to send everyone home early, track officials worked diligently and recovered the racing surface so that the entire program could be completed. It proved to be a most memorable night for at least one driver as rookie Super Stock driver Nick Traynor, making only his third outing behind the wheel of a Super Stock, led from start to finish and held off some top notch competitors to win his first ever feature race in the division. New winners emerged in two divisions as Hunter VanGilder and Kevin Adams won their first feature races of the season at the track while Curt Myers and Jason Havel repeated opening night triumphs with their second straight wins. Twenty one cars took the green flag for the Super Stock feature and sharing the front row with Traynor was another rookie in the person of Adam Soltis. Things got off to a slow start to the race as the yellow was displayed before a lap could be completed as Curt Myers got into the back of another car, climbed up on it and then spun. His evening would be done before one lap was complete. The second attempt saw Traynor and Soltis go side by side before Nick was able to edge into the lead. With Soltis battling hard to maintain second, he was challenged by Willie Johnsen Jr for the spot as Aaron Wilson and Scott Lawrence were also on the move. Traynor continued to lead as Johnsen Jr slipped into second and started to cut into the leader's advantage. Some great fighting for position was going on behind them as Jeff Klopstein Jr and Nick Oreskovich were also working their way toward the front of the pack. Johnsen Jr was working very well on the high side and he nearly slipped past Traynor, only to see the yellow fly for a spin. On the restart, Traynor accelerated away from the field to maintain his slight advantage. Lawrence then made a determined charge that saw him close to Traynor's rear bumper as the yellow once more set up a two lap dash to the finish. Traynor got away well and while Lawrence and Johnsen Jr both pressured him, Traynor made no mistakes as he crossed the line to win by a car length over Johnsen Jr who nipped Lawrence for second. Oreskovich continued his march as he moved up to fourth at the end with Klopstein Jr next in line. As might be expected, Traynor was a thrilled winner in victory lane. Hunter VanGilder has been plagued with mechanical issues during the early part of this racing season but he put all that behind him Saturday as he drove an outstanding race to pass Kevin Bogdanovic with only two laps to go and win his first Street Stock feature of the year. Bogdanovic started on the pole and pulled into the early lead in a race that would go non stop, green to checkered. VanGilder started in the third row but he got a great start and quickly swept past Ashley Wahlstrom and Kolby Kiehl to take third and put Bob Wahlstrom behind him to move into second. As Bogdanovic continued to work the inside line, VanGilder moved up the track and was able to keep his momentum rolling and he gradually closed in on the leader. He pulled up beside Bogdanovic down the front chute and swept past him in turn one to take over the lead. He continued his march as he gained more space on the final two laps and drove home the winner. Cody Kummer made up a lot of ground near the end of the event and he came home third of Ashley Wahlstrom who held off Sam Fankhauser for a spot. Adams wasted little time getting to the front of the Modified feature as he ducked inside of Pat Hoffman and grabbed the lead early. This was also a nonstop main event and Adams used the continuous green flag conditions to build a big lead, one that stretched to a straightaway as the race reached its conclusion. The best battle was for second as Hoffman and Mike Anderson went side by side for many laps before Anderson was able to edge past him as Hoffman had his car working well on the top side of the track and for a number of laps, he repelled all challenges from Anderson before Mike was finally able to edge away from him. 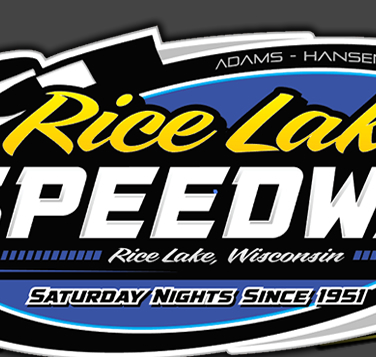 Adams win was his first of the year at Rice Lake and Anderson settled for second while Hoffman drove and excellent race and was credited with the third position. Steve Hallquist's first run of the year at the track netted him a fourth place finish as he edged Justin Oestreich for that place. While Myers had a rough night in the Super Stocks, he eased the pain somewhat by racing to his second straight win in the Midwest Modifieds. Myers was charging early and it took him only four laps to come from the eighth starting spot and edge past Wayne Stricker for the lead. However, Stricker was not about to give up and he pushed Myers the rest of the way as several restarts during the contest kept bunching the field and each time, Stricker would challenge to take back the lead. Stricker had his own problems too as he was constantly challenged for second by Tyler Vernon and then later Joe Chaplin Jr and Ryan Viltz. They traded positions back and forth and after each restart it seemed like they jockeyed for position with the running order changing. This race also saw a late yellow that set the stage for a two lap sprint to the finish. Myers had Stricker on his tail but Curt made no mistakes as he drove home with a one car length lead for the win. Stricker maintained second but there was some shuffling behind him in those late laps and Chaplin Jr came home third ahead of Viltz and Shane Halopka. The Pure Stock feature was the third nonstop main event on the night and after Jason Havel won last week, he was the driver to beat. Havel started on the pole and led all the way for his second Pure Stock win. He was challenged by Joel Hinrichs however, who ran side by side with him for two laps before Havel was able to edge in front. And Hinrichs managed to stay close to Havel, nearly sneaking by him late in the race when they got into lapped traffic. Hinrichs made one last push on the last lap but he came up a car length short as Havel drove home for the win again. Tucker Quinn drove a consistent race to finish third while Randy Graham debuted his new car with a fourth place finish. Michael Miller was the hard charger of the event as he started tenth on the grid and drove all the way up to fifth at the finish. Before the races, Best Appearing Car Awards, as voted on by a panel of neutral observers, were made . Named as Best Appearing were Quinn-Pure Stocks, VanGilder-Street Stocks, Viltz-Midwest Modifieds, Traynor-Super Stocks and Ashley Anderson-Modifieds. 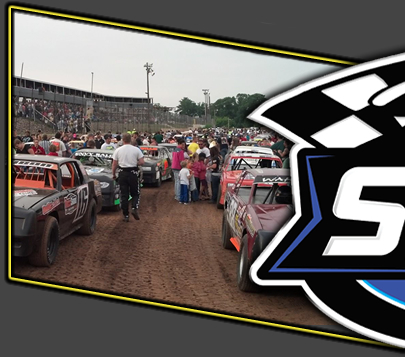 Racing continues at the speedway next Saturday, April 30th with all five classes again appearing in racing action. Warm ups start at 6:30 p.m.